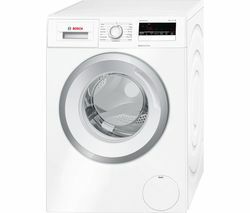 Get some help with your laundry with German precision engineering from Bosch. Bosch washing machines feature the latest laundry technology to make light work of the weekly wash. From large capacity to compact washing machines, whatever your family’s needs we’ve got a washing machine to match. 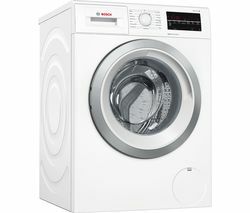 Our Bosch washing machines come in a range of widths and capacities – from 6kg models to 9kg models – so however much space you have in the kitchen or laundry room, and however much washing you need to tackle each day, you’ll find a machine to fit. With a wealth of clever programmes to choose from, including quick wash functions that get your clothes clean in just 15 minutes, you can be sure your fabrics are perfectly cleaned and cared for. All of our Bosch washing machines are eco-conscious, with energy ratings from A+ to A+++, so you’ll save money and energy with every spin. Bosch’s VarioPerfect system gives you total control of your laundry too. If you're in a hurry, you can speed up the washing process by up to 65%, and if you want to wash your laundry economically, you can reduce your energy consumption by up to 50% - and all just by pressing a button. For real convenience and cleaning power for your laundry needs, Bosch washing machines offer stylish machines of all sizes that are perfect for your home.